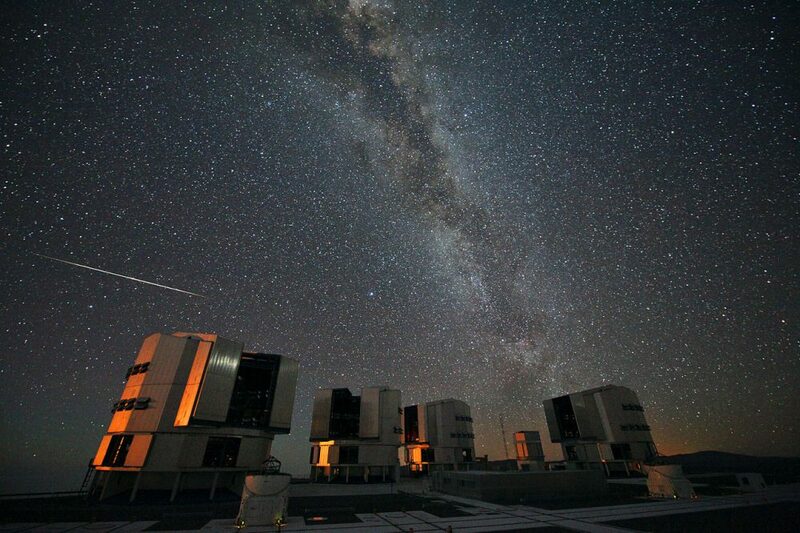 The Perseid meteor shower is an annual meteor shower that occurs from July 23 to August 20. The meteor shower is associated with the comet Swift-Tuttle. It peaks around August 12-13 every year. The Perseids are also sometimes called the “tears of St. Lawrence” because they peak near the date of the saint’s martyrdom, August 10. The shower’s name is partly derived from the Greek Περσείδες (Perseides), a term from Greek mythology meaning “the sons of Perseus.” The meteor shower is associated with Perseus because the radiant, or the point from which the Perseids appear to come in the sky, is located in the direction of Perseus constellation. The name Perseids is pronounced /ˈpɜrsiːɨdz/. The radiant only forms a chance alignment with the constellation, as the stars in Perseus are light years away from Earth while the meteors are only about 100 kilometres, or 60 miles, above our planet’s surface. The Perseid meteor shower is spawned by the comet Swift-Tuttle, formally designated 109P/Swift–Tuttle. Every year, our planet crosses the comet’s orbital path and passes through a trail of debris, with bits and pieces of the comet slamming into the Earth’s upper atmosphere. Like all meteor showers, the Perseids are a spike in the number of meteors, the icy debris and small rocks shed by comets along their orbits. These meteoroids travel at more than 100,000 miles per hour and leave streaks of light as they ignite and vaporize in the Earth’s upper atmosphere. Those that are somehow not destroyed in the process fall to the ground and are called meteorites. Even though meteors can be seen anywhere in the night sky, they appear to originate from the same region of the sky, located in Perseus. The stream of debris that appears as shooting stars to viewers stretches along the orbit of Swift-Tuttle and is called the Perseid cloud. The comet has a 133-year orbit and ejects particles as it travels. These particles form the Perseid cloud and have been part of it for about a thousand years. The Perseids peak on August 13, but a relatively young dust filament in the stream pulled off Swift-Tuttle in 1865 can provide an early peak the day before, on August 12. The Perseids can be viewed from mid-July, with the peak in activity occurring between August 9 and 14, when 60 or more meteors per hour can be seen streaming across the sky. The greatest rate of meteors can be spotted in the hours before the dawn. Most of the meteors disappear at heights above 80 kilometres. The Perseid meteor shower is primarily visible in northern latitudes because of the path of the comet’s orbit, but can be seen all across the sky. As the radiant in Perseus never rises above the horizon in southern latitudes, observers in the southern hemisphere see significantly fewer meteors than those in the north. The shower is best viewed from dark locations, away from city lights. 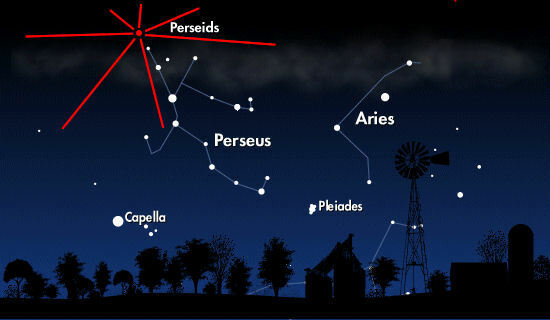 The constellation Perseus, from which the Perseids appear to originate, is located in the northeastern part of the sky. The meteors are best viewed between the constellation and the zenith, the point in the sky directly overhead, but it is not necessary to know where Perseus is located as the meteors appear in all parts of the sky. 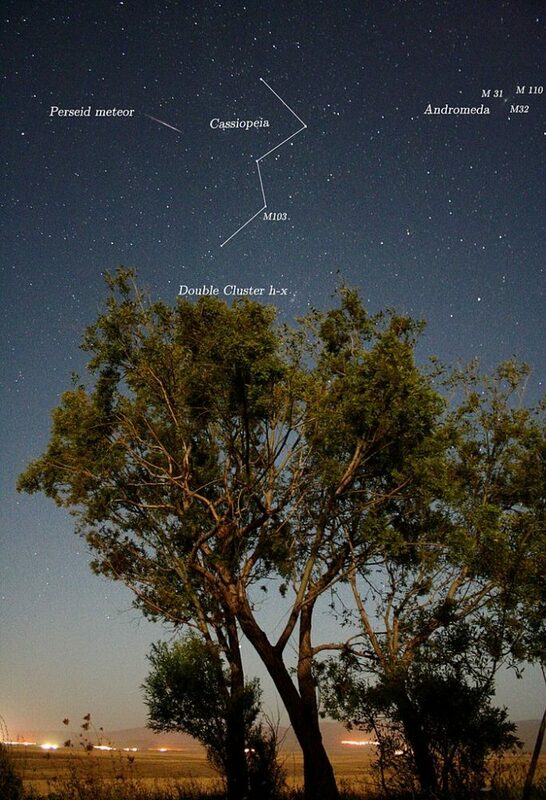 The Perseids are easiest to see when the sky is the darkest. This will depend on the Moon’s phase, but meteor showers are generally best observed in the hours right before sunrise. 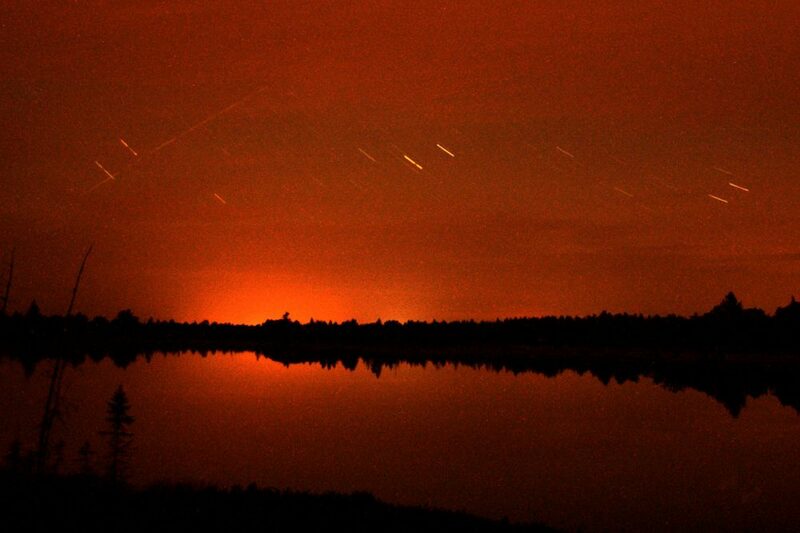 The best time to observe the Perseids is between 2 and 4 a.m. when the Earth is facing into the pebble swarm. It is, however, possible to view the Perseids as early as 10 p.m. To take pictures of the shooting stars, camera’s ISO (sensitivity to light) should be set to a high number, with very long exposures (30 seconds at the minimum). In 2014, the bright waning gibbous Moon (a nearly full Moon) will interfere during the peak period, with the biggest full Moon of the year appearing on August 10, so waiting until the peak nights is probably not the best option to observe the Perseids this year. In 2015, the skies will be significantly darker, with the new Moon appearing on August 14. The exact days, meteor rate, and intensity of the Perseids’ peak (or peaks) are difficult to predict as they change from year to year. Sometimes there are more bright, large meteors and at other times, smaller ones are more plentiful. This happens as a result of an irregular mass distribution within the meteor shower’s stream. The Perseids are notable for their fireballs, larger explosions of light and colour that originate from larger pieces of cometary debris and can be visible longer than regular meteors. They are also usually brighter, with magnitudes reaching more than -3. In 2013, the average peak apparent magnitude for the Perseids was -2.7, significantly brighter than the peak magnitude for the Geminids (-2). The Perseid meteor shower can be observed as early as July 23, when one meteor can be seen every hour or so. Over the following weeks, the intensity builds up, and about five meteors per hour can be visible in early August. By August 12 or 13, observers can see between 50 and 80 Perseids per hour, and once the peak period is over, the rate declines to roughly 10 per hour by August 15, and back to only one per hour by August 22. 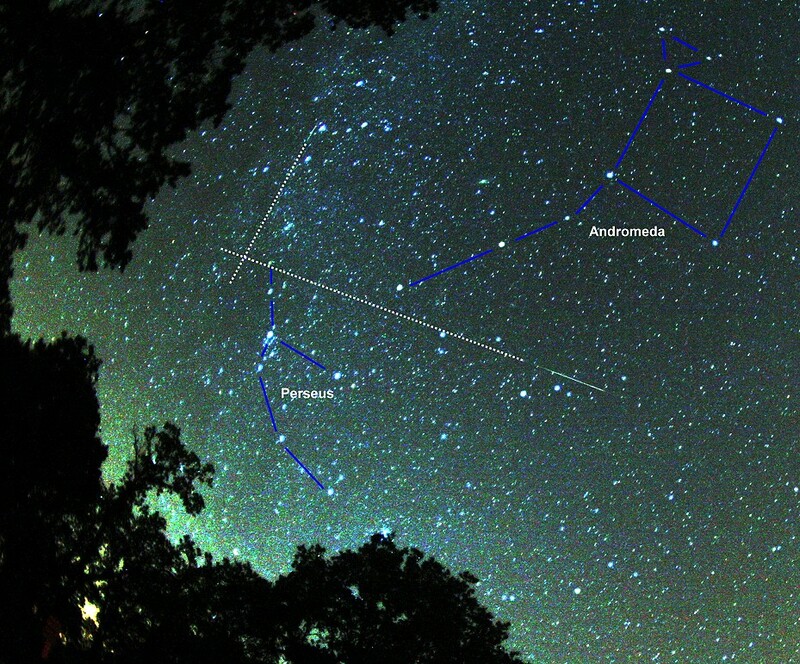 The main radiant of the Perseids is located in the direction of the star Eta Persei, with other major radiants situated near Chi and Gamma Persei, and minor ones near Alpha and Beta Persei. In Greek mythology, the Perseid meteor shower is associated with Perseus constellation. It is said to commemorate the time when Zeus, Perseus’ father, visited Danae, Perseus’ mother, in a shower of gold. The Perseid meteor shower was first documented in Chinese annals, mentioning that “more than 100 meteors flew thither in the morning” in the year 36 AD. 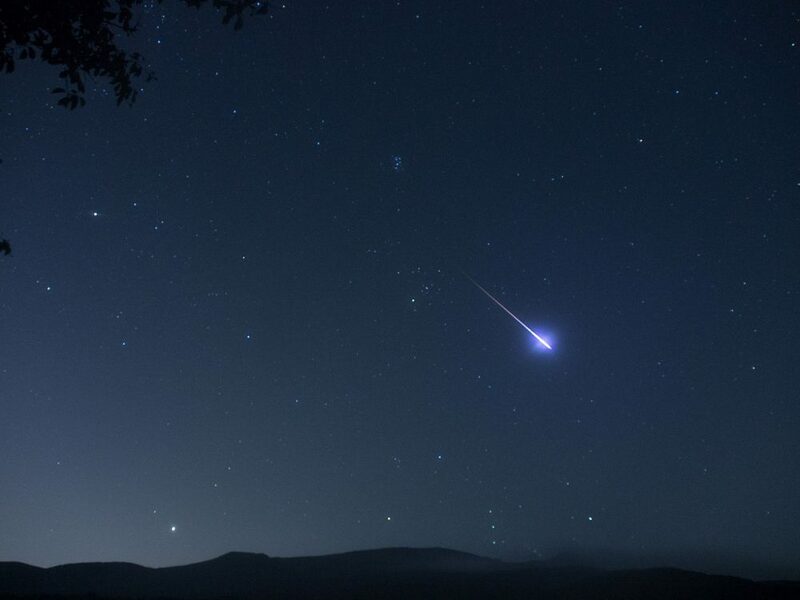 The meteor shower is mentioned in a number of records in China, Japan, and Korea between the 8th and 11th centuries, but there aren’t very many references to it between the 12th and 19th centuries. The Belgian astronomer and mathematician Adolphe Quetelet is generally credited for recognizing the Perseids’ annual appearance. In 1835, he reported that there was a meteor shower occurring in August, appearing to come from Perseus constellation. The comet Swift-Tuttle was discovered independently by two American astronomers, Lewis Swift and Horace Tuttle, in 1862. The comet is quite large, with a nucleus 26 kilometres or 16 miles across, which is more than twice the size of the object believed to have caused the demise of the dinosaurs. The comet’s size and the size of the meteoroids it leaves behind are the reason why we see so many fireballs during the peak. In 1865, the Italian astronomer and science historian Giovanni Schiaparelli was the one to make the connection between Swift-Tuttle and the Perseids, realizing that the comet was responsible for the meteor shower. This was the first time that a meteor shower was positively identified with a comet. Swift-Tuttle has an eccentric orbit, one that takes it inside the Earth’s orbit at its closest approach to the Sun and way outside Pluto’s orbit when at its most distant from the Sun. The comet orbits the Sun with a period of roughly 133 years. Whenever it passes through the inner solar system, Swift-Tuttle is warmed by the Sun, which causes it to leave fresh debris along its orbit. Swift-Tuttle last reached its closest point to the Sun, known as the perihelion, in December 1992. It will reach it again in July 2126.